I’m been exceedingly lazy since returning from my trip and haven’t posted any entries discussing anything since returning. I did manage to put up (most) of the posts from when I was actually travelling. I’ve fallen in and out of illness for the past few days. In fact, I woke up last night with horrible nausea and stomach cramps. I did plan on going to work this morning, but me and my puking self had other plans. I’m in bed now and have been here all day. I’ve taken this time in bed to compose my email to the airline my family and I flew with to the UK to discuss all of the fiascos that had occured, including feisty flight attendant. I hope to get a response/explanation soon. The “Flare For Fashion” fashion show is fast approaching. In the near future it’ll be time to go and record my personal story for the beginning of the show, which will be played just before myself and the other personal story tellers walk out on the stage. I’m very happy to have found the dress that I’ll wear to the show and after the runway bit. I wasn’t at the point of stressing out about it yet, but I definitely did have my eyes peeled for a new dress, and luckily I found it! It’s a blue, fitted yet loose fitting dress from Mendocino. It’s a halter style dress, but the halter aspect of the dress is formed by a beaded necklace. It’s nice! I’ve also spent some time looking online for ideas on a cake that I have to make for September 14th. It’s a cake that’ll be going to a church service which is in celebration for a couple who recently got married. My main idea right now is to make a white or ivory coloured cake which has the appearance of a brown tree growing up the side of it. The tree will have red, orange, and yellowish flowers (or leaves, haven’t decided yet) on it, and some on the “floor” of the cake as well. I think it’s an appropriate choice for a cake in September…which I guess isn’t quite fall, but is getting very close to it. 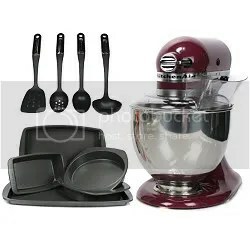 I ordered myself a brand new kitchenaid mixer yesterday from the shopping channel’s website. I’m excited to get it, and I’m also excited to mail in the rebate form and get $50 back on it! LoL. One of the main selling points for me was the fact that it comes with some bakeware and accessories. The colour (described as boysenberry) is also fab. Here’s a picture of what will soon be my new pride and joy. LoL. As one gets to know me well, they’ll quickly learn that I’m VERY into things that have to do with cooking and food. I love reading cookbooks cover to cover. I love my little kitchen gadgets. I love to create things and see the look on people’s faces when they see it. I can’t wait to get this thing plugged in and start making some delectable baked treats!